Support Us - Oregon State KofC Charities inc.
Oregon State KofC Charities, Inc. is a 501(c)(3) organization established by the Oregon State Council to provide fiduciary oversight of funds donated in support of established Knights of Columbus charitable programs within the state of Oregon. All donations made to the Oregon State KofC Charities, Inc. are tax-deductible. If you have any questions regarding your donation, please email us by clicking the CONTACT US tab above. Please know too that 100% of your donation will be used for the programs you designate. To help make it more convenient for you to donate to the Oregon State KofC Charities, Inc. we have instituted an electronic payment option. 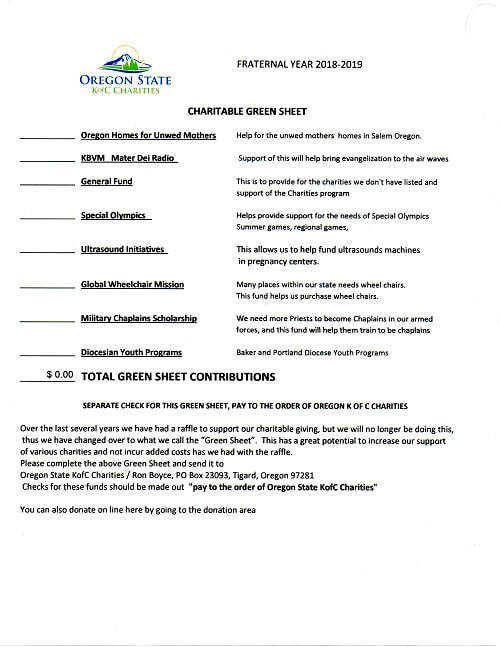 This offers you the opportunity to make automatic financial contributions from your bank account or credit card to the Oregon State KofC Charities, Inc.
Over the last several years we have had a raffle to support our charitable giving, but we will no longer be doing this, thus we have changed over to what we call the “Green Sheet”. This has a great potential to increase our support of various charities and not incur added costs has we had with the raffle. Checks for these funds should be made out "pay to the order of Oregon State KofC Charities"
Click the form at left to open the form in your browser and print it out. Click the link below to download the PDF form to your computer. Planned giving helps donors to contribute to a specific charity such as the Oregon State KofC Charities, Inc. and simultaneously gives more of their assets to their family than would otherwise be possible. If you have any questions regarding your estate Planning donation, please email us by clicking the CONTACT US tab above. Make a donation to the Oregon State KofC Charities, Inc. using appreciated stock, bonds or mutual fund shares instead of cash donations. A gift of appreciated securities provides increased tax benefit to you. The benefits of gifting securities that you have owned for more than one year or have inherited are twofold: you are able to take a tax deduction for the current full market value of the securities and you avoid capital gains tax that is incurred when you sell a security. If you have any questions regarding your Stocks, Bonds, and Securities donations, please email us by clicking the CONTACT US tab above. The Oregon State KofC Charites requests your support of the below listed statewide charitable projects. These projects directly reflect the State’s and the Order’s on-going commitment to support community, family, pro-life, and youth programs. Oregon State KofC Charities, Inc. is a 501(c)(3) organization established by the Oregon State Council. All donations made to the Oregon State KofC Charities, Inc. are tax-deductible. Please help support established Knights of Columbus charitable programs within the state of Oregon. Please know too that 100% of your donation will be used for the designations you make below. Instructions: Choose a donation level, or enter your own amount. Click "continue" and enter your name and address and continue. You will then see a menu allowing you to select your project. Click continue to enter your payment information, then click "Finish"